We’ve had some really great feedback from our users and just like you, we are working hard to make our product as useful and easy to use as possible. So, with that said, we are really excited to announce a new feature in Sympli that will help big teams collaborate better. Read on to find out what we’ve been preparing for you over these past several weeks. Bon appétit! Finally, a feature to allow big teams to all work within one account without having to bother with project ownership transfer. 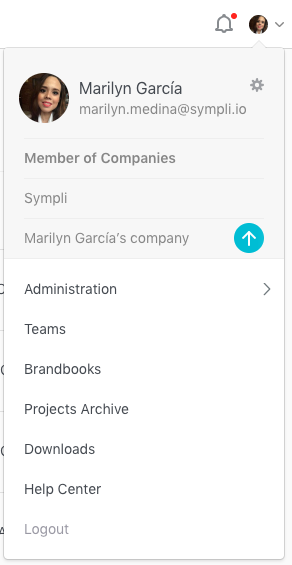 Enterprise plan subscribers on Sympli can now convert their accounts into a Company so that every team member can create projects within the Company. To make team collaboration easier, we introduced Enterprise-level roles into Sympli. Those roles are defined as Guest, User, and Admin. A Guest is someone invited into one or several projects, but they aren’t part of the Company (like contractors, partners, or customers). They don’t have access to other Company’s projects, nor can they create projects in a Company. However, they have access to the projects where you need them. To make it flexible for different scenarios, a Guest can either have read-only project access or can be turned into a project Power User, so they can upload designs and manage project settings. It’s your call! A User can create projects within the Company and can access their own projects and other Users’ projects they were invited to. Being an Admin is the best of both worlds because it combines all of the Guest and User features with additional access and ability to manage all projects within a Company. These are the folks on your team who can also invite users to the company, manage their roles or revoke user and guest access completely. Enterprise plan subscribers will find their Company's option in the main menu, which is by default available to the account owner only. You can change the Company name and manage the Company’s team. The recommended flow for account owners is to leave the Company account (just for billing purposes), and create another account with an Admin role for actual work. All users that were not explicitly added to the Company will be listed as Guests, each Company Admin can adjust their role at any moment. Teammates that were deleted from the Company will also be deleted from any project where they previously had access. After you accept the invitation to the Company, you can choose where to create a project—in your personal account or in the Company account. Please make sure your plugins and extensions are up-to-date. Create projects in a Company or in your Personal account with Sketch or Photoshop plugins, or in Sympli web app. We hope you liked the updates and always appreciate a shoutout to @sympli_io! Not a big team? Sympli works great for teams of all sizes, so give our Individual Plan a shot! And don’t hesitate to contact us with any questions, feedback or feature requests you might have.